Pinus larix L., Sp. Pl. 1001, 1753. Miller, P. (1768). Gardeners Dictionary ed. 8: Larix #1. USDA, ARS, Germplasm Resources Information Network. Larix decidua in the Germplasm Resources Information Network (GRIN), U.S. Department of Agriculture Agricultural Research Service. 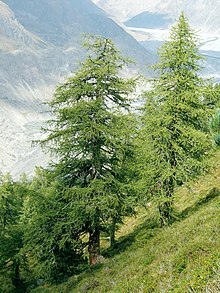 For more multimedia, look at Larix decidua on Wikimedia Commons.